Jim Gavin's odd new series about a mysterious clubhouse can't balance its laid-back charm with lackadaisical pacing. Dudley’s reaction is muted; a common response from the former surfer, and one that, in itself, is telling. He’s just heard a thought-provoking statement, given that it sounds counterintuitive on first read yet stands up to closer scrutiny when given the room to breathe, and “Lodge 49” isn’t shy about letting scenes breathe. The slow-moving new AMC drama creates a distinct atmosphere right from the start, but despite more light commentary on America’s fluctuating employment conditions — and our general purpose in life — it’s Dudley’s disconnected demeanor that permeates more thoroughly than any relevant remarks. In short, “Lodge 49” is a little too content to just let things happen instead of pushing the issue. While each hour can feel like a respite from dense dramas of overwhelming intensity, the Southern California story also feels minor to the point of being inconsequential. Its star is so simple he’s not all that interesting, and the supporting cast is too well-defined for all their eccentricities. Their clear motivations are meant to help viewers get lost in the characters’ curious surroundings, but the few mysteries kept percolating through five episodes aren’t all that compelling. 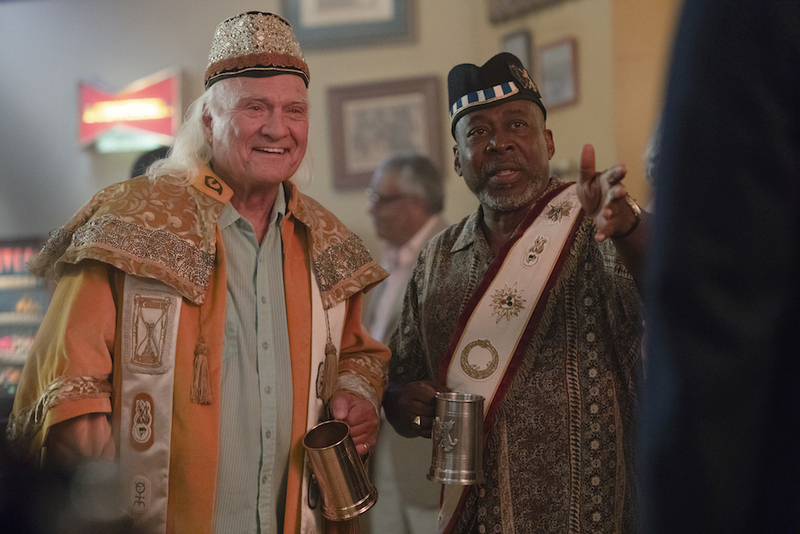 “Lodge 49” is a weird little show, to be sure, but the strangest aspect of all is how it still doesn’t leave an impact. Dud is fully defined in the premiere. Bearded, broke, and at peace with his wandering lifestyle, the walking SoCal stereotype (who shares more than a little DNA with Jeff Bridges’ “Big Lebowski” character) is even carrying a metal detector across the beach when he’s initially introduced. That’s how he finds a gold ring with a strange symbol on it, which he in turn tries to pawn for a watch. Turns out his buried treasure isn’t made from real gold and Dud’s interest in it drops considerably. Though his potential buyer tells him about a not-so-secret order of the Lynx that gives members similar rings during their lodge meetings, it’s not until a fateful occurrence later in the first hour that Dud finds meaning in the presumably worthless artifact. Meanwhile, viewers also get to know Ernie (Brent Jennings), a pipe salesman who’s down on his luck at work, in his love life, and with his bookie. His only unmarred joy comes from Lodge 49, where he’s got lots of friends and an open tab at the bar. Though Larry Loomis (Kenneth Walsh) runs things over there, it’s one of the followers and Dud’s sole family member who really stand out among the supporting cast. Dave Pasquesi brings a weed-dealing bartender named Dr. Blaze St John to wacky life, while still forging real connections with his fellow lodge members, and Sonya Cassidy makes a working waitress so empathetic she often overshadows her doofy brother. Having a strong cast is always a plus, but lacking the balance to properly utilize them makes “Lodge 49” a bit all over the place. One overarching story is focused on Dud’s quest to get his life back, but he’s not all that motivated to do it quickly. Another is about the lodge and its mystifying international history, but there’s no reason to believe this place holds wider significance than what its members find in it on their own. Still one more is an aging Ernie’s goal to make the most of the time he has left, and yet his choices don’t feel substantial enough to feel like he’s actually going for it. Most of the arcs lack urgency, and most of the time that feels intentional; creator Jim Gavin’s world is observational and can feature charming, even jubilant tidbits from its capable cast. There’s just not enough. Stories like this need to provide more heart more often; tightly packing each episode with astute observations and meaningful moments in a way where they don’t feel over-stacked. Gavin includes too much, and “Lodge 49” ends up wasting its enticing and peculiar premise in a light, plodding story. It’s the kind of freshman entry that could grow into something special, but you’d have to have Dud’s availability and demeanor to get there. “Lodge 49” premieres Monday, August 6 at 10 p.m. on AMC.